The Boland Stud’s draft for the 2019 National Yearling Sale, includes a filly (Lot 268) from the very first crop of exciting new stallion Coup De Grace. Coup De Grace, the only son of triple US champion sire Tapit at stud in South Africa, was a lightning fast horse in his own right. 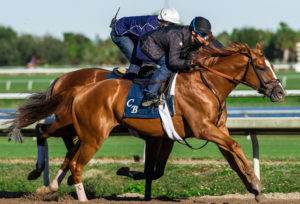 The flashy chestnut, a half-brother to US Gr.1 winner Dancing Rags, made a winning debut over six furlongs at Aqueduct before going on to win both the Gr.2 Amsterdam and Gr.3 Bay Shore Stakes to establish himself as one of the quickest members of his generation. Also third in the Gr.1 King’s Bishop Stakes, the regally bred Coup De Grace is out of Home Court –a Gr.3 placed daughter of Storm Cat and US champion, and Gr.1 Breeders’ Cup Distaff winner Jewel Princess. The chestnut has already had members of his first crop fetch up to R750 000, and Coup De Grace looks an exciting addition to the local stallion ranks. 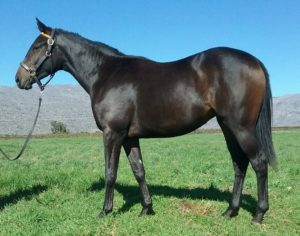 Boland Stud’s Coup De Grace filly is out of the winning Jet Master mare Allez Afrique, already dam of a pair of winners. The well-bred Allez Afrique (bred on the same Jet Master/Al Mufti cross as Gr.1 winners Yorker and Little Miss Magic) is a half-sister to Gr.1 Cape Flying Championship winner O Caesour, and her dam is a winning daughter of outstanding broodmare sire Al Mufti. This is also the family of champions Enchantress, Harry’s Charm, Laverna and National Currency, as well as such Gr.1 winners as Enchanting and Siren’s Call. Broodmare sire Jet Master is fast becoming an outstanding broodmare sire, with his daughters having already produced the Equus Champions Edict Of Nantes and Lady In Black, the Gr.1 winning half-brothers Rainbow Bridge (Sun Met) and Hawwaam (SA Classic), and Gr.1 Cape Fillies Guineas runner up Silvano’s Pride. This filly has been bred on a similar cross to the one that produced Gr.1 winners Frosted, Tapizar, Laragh and Rutherienne. PreviousDanon Platina sister off the mark!